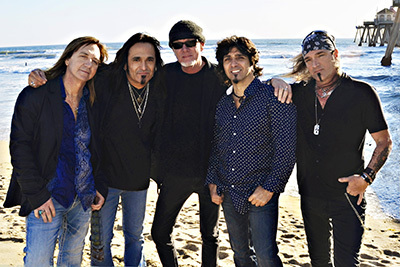 Great White now features co-founder Mark Kendall (guitar), and 28-year-veterans Michael Lardie (guitar, keyboards) and Audie Desbrow (drums). They are joined by lead singer Terry Ilous and bassist Scott Snyder. The group emerged unscathed from late 2011 band member changes. Best known for the 1989 smash "Once Bitten, Twice Shy", Great White's worldwide sales are approaching 10 million. Their song arsenal also includes "Rock Me", "Save Your Love", "The Angel Song", "Mistabone" and more!